Clarksville, TN – On December 23rd Austin Peay State University officially announced the hire of 30-year-old Will Healy as the 19th head football coach in school history, but it’s not the first time the school has gone with a very young head coach for the program. In 1979 Austin Peay hired its then 10th head coach, a 29-year-old Watson Brown to replace James ‘Boots’ Donnelly, in hopes to continue a streak of winning seasons – which included the only Ohio Valley Conference title in the program’s history in 1977. While there is a difference of 36 years between hires, the similarities leading up to coming to Austin Peay are striking. First, Healy was an all-state quarterback for Boyd-Buchanan High School, in Chattanooga, TN, while Brown was one of the nation’s top-rated prep quarterbacks coming out of Cookeville, TN. Both would have success as college quarterbacks, with Healy playing at the University of Richmond, where he was a team captain on the Spiders 2008 NCAA Football Championship Subdivision national title team. Brown was a four-year starter at quarterback for Vanderbilt University, helping lead the Commodores to their most wins in a four-year period in over a decade – including an upset win over No. 13 University of Alabama as a freshman. After their college playing days both went into coaching on the collegiate level, with Healy joining Russ Huesman – who was one of his coaches at Richmond – at the University of Tennessee at Chattanooga, when Huesman took over as the head coach for the Mocs in 2009. During his time at UTC (seven years), Healy has been a quarterback coach, receivers coach and this past season was also the programs passing game coordinator. Brown was an assistant coach for six seasons prior to coming to Austin Peay, being a graduate assistant at Vanderbilt, quarterback/wide receiver coach at East Carolina (two years), Jacksonville State offensive coordinator two years – including a NCAA Division II championship game appearance in 1977 – and finally on year as an assistant at Texas Tech. Until their hires as Austin Peay’s head coach Healy and Brown had careers that mirrored each other. But where Brown came into a program that was coming off two winning season and a conference championship, Healy is taking over a program with only one overall win in three seasons and only two winning campaigns in the last 14 years. 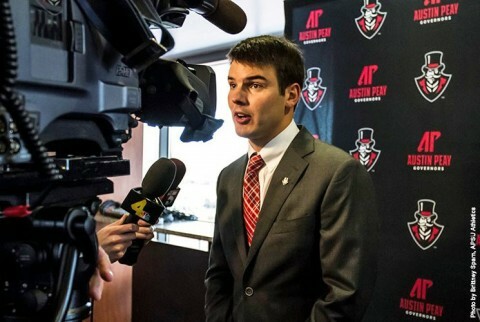 While Brown only stayed two seasons, going 7-4 both years, Austin Peay hopes Healy tenure will not only be longer, but also along the lines of what he helped do at UTC – helping turn a program that suffered 10 losing season in the 11 years before he arrived on Huesman’s coaching staff to a program that had had six winning campaigns in his seven seasons with the Mocs; including NCAA postseason appearances the last two years. Only time will tell how this hire will go for both Healy and Austin Peay, but once it worked out well for a young coach and the Governors. Hopefully history will repeat itself. Chris Austin is a graduate of Clarksville High School and Austin Peay State University. Chris is a former Head Softball Coach for APSU, and assistant basketball coach for CHS. Chris has worked at the Leaf-Chronicle, and WJZM News/Talk/Sports radio. Has also worked at the Sports Information Department at APSU, and has covered championship events for the Ohio Valley Conference and NCAA. Chris is an avid sports fan and can be found at most Austin Peay State University sports events.